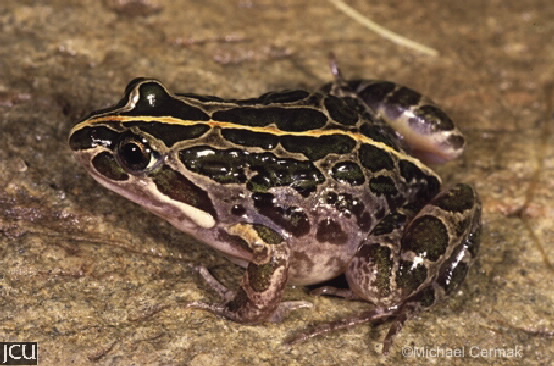 This frog can be found in a number of habitats particularly in grassy areas near waterholes. The brown to olive green body has a series of large brown blotches on the back, and there is usually a narrow stripe from snout to vent which varies in colour from white to rusty. There is also a dark band running from snout to the forelimb area, belly is whitish. Fingers are unwebbed but there is frequently a small amount of webbing between the toes. The tympanium is indistinct.